This painting and I had a long discussion in the course of its painting. 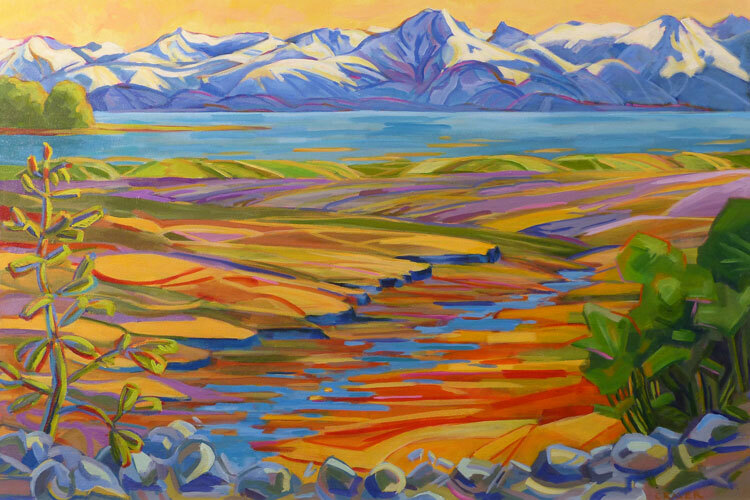 My initial fascination was with showing the dimensionality of the Chilkat Mountains seen across Lynn Canal. Then the tidal flats became interesting and forced me to move the horizon line up and repaint the mountains. Of course the foreground had its own issues, so more changes had to be made. I find that each painting begins with a spark of excitement but as the days pass working out that initial idea, the painting itself begins to assert its own identity. Trusting the process and knowing that I can make changes allows me to explore ideas and incorporate exciting color juxtapositions as I go along.